Tucson Motorcycle Accidents Lawyers, Injury Attorneys | Russo, Russo & Slania, P.C. There are a wide range of different reasons that motorists may be attracted to motorcycles as an alternative to other forms of transportation, but the unfortunate reality is that motorcyclists face serious risks to their health and safety when sharing the road with cars. Whereas car accident victims have the added protection of certain safety features such as airbags and seat belts, the relative exposure of motorcycle riders and passengers means that the potential for catastrophic injuries or even death in the event of an accident is greatly increased. At Russo, Russo & Slania, P.C., we know that motorcycle accident victims in Tucson are often forced to cope with serious challenges as a result of their injuries, and in many cases, it may be necessary to pursue legal action in order to recover the compensation needed to deal with these challenges. Fortunately, with the help of a skilled and knowledgeable lawyer, many victims are able to get this compensation, allowing them to better deal with the aftermath of a motorcycle accident. Russo, Russo & Slania, P.C. can help you through these challenging times. Contact our motorcycle accident attorneys today at (520) 529-1515. If you or a loved one has been injured in a motorcycle accident, you may be facing overwhelming repercussions. To begin with, motorcyclists are perhaps the most vulnerable drivers on the road, and their accidents can often result in serious injury and even death. To compound the probable health setbacks, you are likely forced to grapple with a series of economic obstacles. Medical and vehicle repair bills, for instance, can take their toll during this trying time, especially if you are unable to work and continue earning wages. After a motorcycle accident, you need to seriously consider your legal options. If another driver was at fault for your injuries, compensation may be the way for you to maintain your livelihood. Unfortunately, seeking legal compensation after a motorcycle accident is a taxing process. During this chaotic time in your life, figuring out the right legal path on your own can prove to be altogether impossible. When you’re overwhelmed by the numerous consequences that follow a motorcycle accident, you shouldn’t pursue compensation alone: you need a skilled and knowledgeable legal team to fight for you. An effective motorcycle accident lawyer can make all the difference in navigating your particular situation, and will help you identify the best possible course of action. With motorcycle accidents, you need to take immediate legal action in order to secure compensation. A dedicated legal team will help you every step of the way, taking it upon themselves to investigate and document the circumstances of your accident, communicate with medical and insurance companies, and follow the necessary procedures to file your claim. With a lawyer on your side, you can relax and focus on recovery, knowing you will receive the highest possible compensation. Choose Russo, Russo & Slania, P.C. 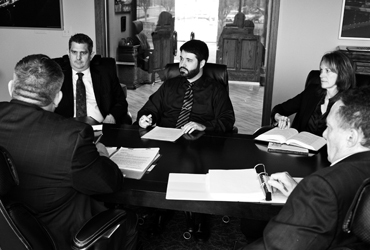 The team of motorcycle accident lawyers at Russo, Russo & Slania, P.C. are here to help you throughout this difficult time. Having advocated for the rights of our clients for over 60 years, our dedicated lawyers bring extensive knowledge of and experience with the legal process to the table. Our ability to effectively secure compensation for our clients certainly stems, in part, from our invaluable experience, but is also largely the result of our ethic of putting our clients’ well-being first. At this firm, your success is our success. If you or a loved one has been injured in a motorcycle accident, you need a legal team that understands the adversity you’re up against and that can effectively advocate for your collection of compensation. At Russo, Russo & Slania, P.C. we’ll put our extensive experience to work, communicating with you every step of the way to discover your best course of legal action for your unique situation. When you or a loved one has been injured in such an accident, there are a number of different kinds of agents that can found to be at fault and held accountable. It is possible to take action against the driver, municipal agency, or manufacturer responsible for the accident and your undue losses. Our attorneys at Russo, Russo & Slania, P.C. can help victims of motorcycle accidents fight for the justice they deserve and need. Thus, if you have been injured in a motorcycle accident caused by someone else, call us at (520) 529-1515. We know how devastating such accidents can be and put our resources and knowledge to work for our clients to get them the justice and compensation they need.